I once wrote that 'tickets or tokens' is the Toronto equivalent of the 'boxers or briefs' question. Outside of the Metropass crowd there are two types of TTC riders: those who buy paper tickets and those who buy tokens. I still prefer tickets to tokens. I can put paper tickets in my wallet - I slip them in front of my credit card. I never lose tickets. Tokens, on the other hand, get mixed with my loose change. I don't use any entrances unattended by a TTC operator, so I've been happily buying tickets for as long as I can remember. That's all coming to an end this summer. 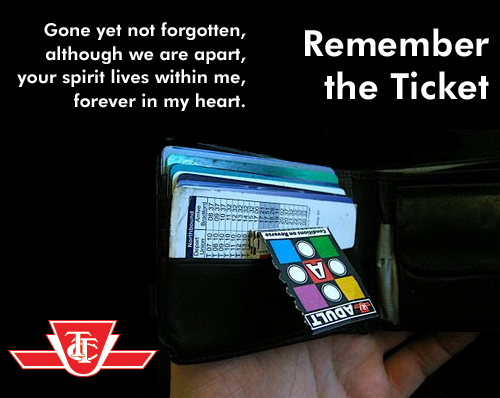 TTC tickets are dying. After September 28, they'll no longer be accepted. The paper ticket is dead, murdered by counterfeiters. I always bought tokens, but I guess that's just my preference. I was a ticket guy when I was a student (and that's the only way you got the student fare... how are they doing that now?). Then I moved to tokens because I didn't ride the TTC enough to get tickets... who knows when I would ride again, and tokens had a longer lifespan. Tokens could also be bought from those automated machines. That was a heckuva lot more convenient than having to buy tickets from a person. Reusable, easy to buy at a machine and they don't rip. I hated whenever I had a token sitting in a coat pocket and then it would slip through a hole in the lining... and afterwards trying to sort em out like unknown change in a sofa. also, I rec'd a spam message-sent only a few days ago at home, twice in an hour, maybe it could have been a real person - hope there isn't a charge next month. We've dropped one archaic technology and kept the other. Hardly a watershed moment in Toronto transit. But yah, I think the ticket media did have some advantages.